When a patient experiences cardiogenic shock, a state in which the heart is too weak to pump enough blood to the patient’s organs, timing is everything. The most common cause of cardiogenic shock is lasting damage to the heart muscle after a heart attack. Only about 7 percent of people who have suffered a heart attack end up experiencing cardiogenic shock, but when it does occur, it is extremely dangerous. Such patients may arrive at BWH though the Emergency Department or Cardiac Catheterization Lab, or may be transferred from another hospital. From there, they require immediate identification and appropriate triage to an Intensive Care Unit within the Shapiro Cardiovascular Center, where a series of consultations about next steps in the patient’s care plan happen, says Mandeep Mehra, MD, executive director of the Center for Advanced Heart Disease at BWH. But as of late August, the BWH center began an innovative, experimental program to greatly speed up the decision-making process and attempt to enhance the clinical care of cardiogenic shock patients. It established a strategic approach called Cardiogenic Shock Team Page Activation and the organization of a “Shock Team,” which brings rapid, shared decision-making to the bedside. As part of the program, when a patient gets transferred to the LCU, a critical care attending will immediately activate a virtual beeper to notify the critical experts of the Shock Team. The four clinicians either come to see the patient directly or consult instantly by phone to discuss next steps. This may lead to sending the patient to the Cardiac Cath Lab for support with a temporary device, or to the operating room for surgery. Ultimately, the system seeks to avoid delays in care and improve care coordination. The concept of the Shock Team has been in place at BWH for months. Leading up to August, a team comprised of the Cardiovascular Division’s Ben Scirica, MD, MPH; David Murrow, MD, MPH; Michael Givertz, MD; and Pinak “Binny” Shah, MD, has been working to create standard operating procedures and protocols. 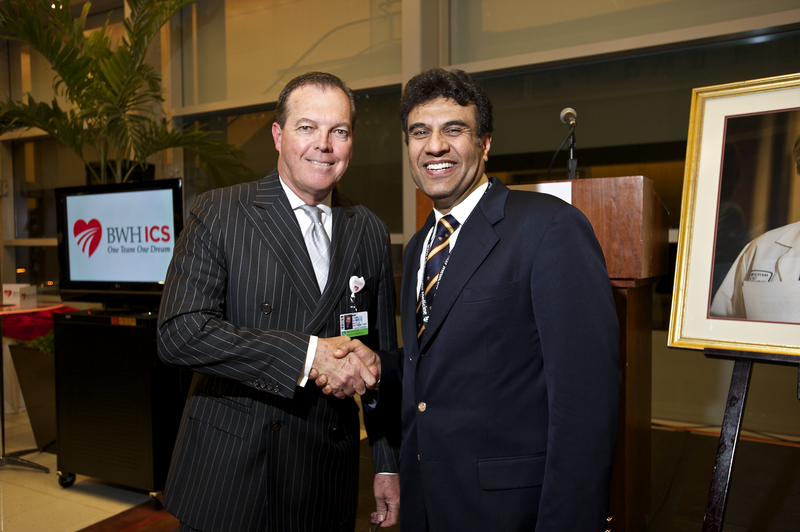 Mehra and BWH Chief of Cardiac Surgery John Byrne, MD, oversee all aspects of the program. As patient data is gathered, the team hopes to record and track outcomes to continue to improve the quality of care for this population of critical patients. “Our goal is that if a patient comes here in cardiogenic shock, we will act swiftly and completely change the outcome for him or her,” said Mehra.